Ronaldo “Jacare” Souza inked an eight-fight deal with the Ultimate Fighting Championship on the eve of “UFC on FOX 24” and Robert Whittaker could not wait to try and play spoiler. Both men are in the elite of a stacked weight class that features contenders all clawing for a title shot that isn’t there. Souza and Whittaker both know the best way to get a title shot is to make an impact, and neither man was looking to just squeeze by with a decision win on such a grand stage. The fight kicked off with a lengthy feeling out process. Souza tried to bring the fight to the mat with a takedown but Whittaker sidestepped the attempt and kept it standing. 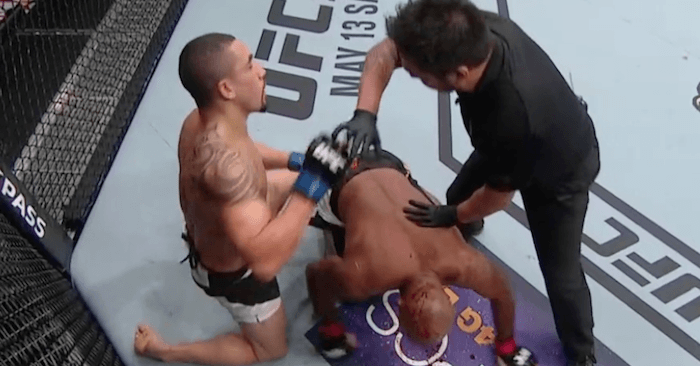 Whittaker was taken down to the mat but he spun through and was able to get right back up to his feet. It wasn’t long before Souza took him right back down and took his back. Whittaker dumped him off and escaped danger by resetting the fight himself back in the middle of the octagon. Whittaker did a fantastic job at picking his shots, whipping a jab and cross that Souza simply did not see coming. They weren’t going to knock him out cold, but it was a great setup shot for Whittaker. Whittaker caught Souza off guard with a massive right hand and dropped him in the opening moments of the second round. Souza tried to get him to the mat, but Whittaker told him to come back standing. Whittaker blasted Souza with a head kick, and Souza wanted to circle away from the shot. Whittaker remained composed and pawed his way within striking distance of Souza before firing off another left hook. Whittaker knocked Souza down to the mat and finished him off! What do you think is next for the winner? The loser? Share your predictions in the comment section below!